What do you get when you cross a rhino with a supersized turtle? Apparently, the answer is Lisowicia bojani. 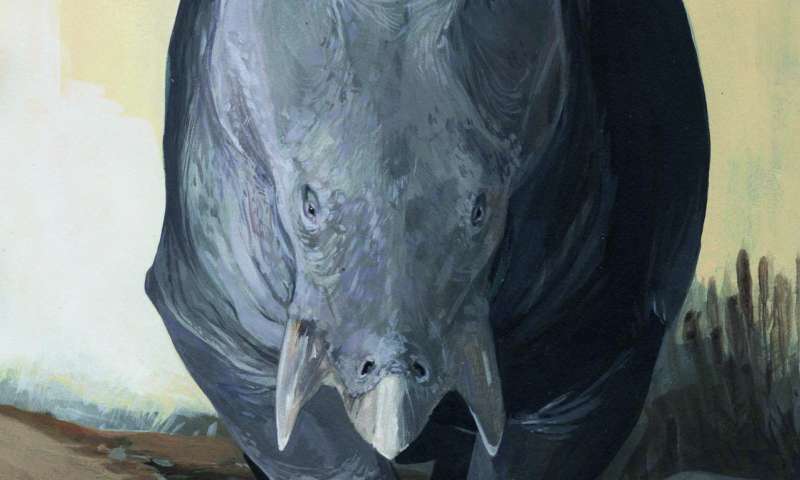 The giant, bizarre herbivore had a beak-like mouth, and was not related to the dinosaurs — in fact, it had more in common with mammals. Artistic reconstruction of Lisowicia bojani, front view. Credit: Karolina Suchan-Okulska. 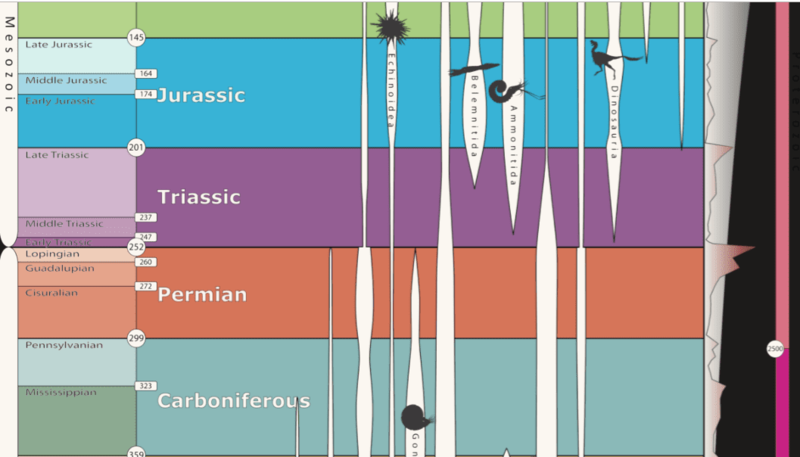 The Triassic period, which preceded the Jurassic, was a pivotal time in the planet’s biosphere. Dinosaurs slowly emerged as the leading land animal group, while the mammals and their relatives “retreated to the shadows” — at least that’s what conventional wisdom says. But this new finding “throws a wrench into that simple tale,” says Stephen Brusatte, a vertebrate paleontologist at The University of Edinburgh. In a new study published in Science, a team of Polish scientists describe a finding that challenges all that theory. 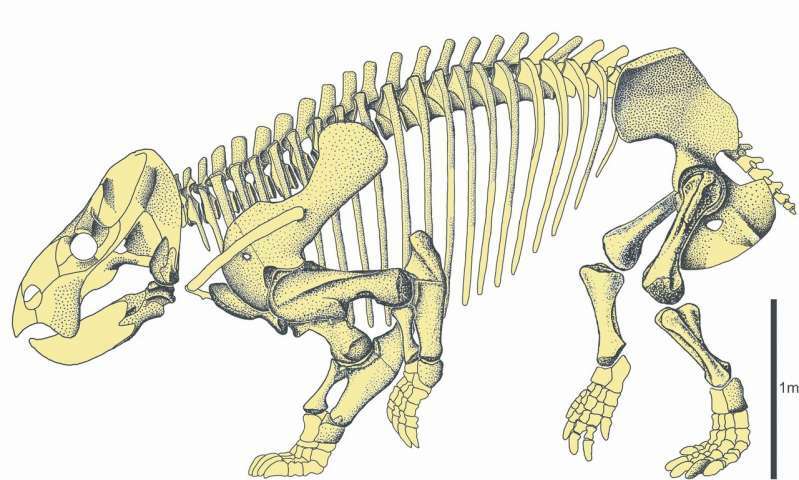 The “new” fossil, a partial skeleton, is a called a dicynodont — herbivorous creatures, with two tusks (hence the name), a strong, barrel-shaped body, and powerful limbs. Dicynodonts are part of a larger group called synapsids, which mammals and all animals belong to. A highlight of the geologic timescale when was living. They were dominant in the Permian (before the Triassic) but were thought to have faded away after that. During the Triassic period (252-201 million years ago) mammal-like reptiles called therapsids co-existed with ancestors to dinosaurs, crocodiles, mammals, pterosaurs, turtles, frogs, and lizards. One group of therapsids are the dicynodonts. The new species Lisowicia bojani is presented above. Credit: Tomasz Sulej. But this finding does more than force us to rewrite an important chapter in evolutionary history — it may point to the factors that drove dinosaurs to evolve into the giants they came to be. A dinosaur group called the sauropods also lived at the time, and sauropods gave produced species such as the long-necked Diplodocus, which could measure over 24 meters (79 feet) and was so big that it probably required auxiliary hearts and potentially even an auxiliary brain. Since two giant groups lived around the same time, it may be that the environmental conditions of the Late Triassic are what spurred the evolution of gigantism, the researchers said. Researchers have hypothesized that sauropods grew big to avoid getting eaten, and the same might be true of L. bojani. The creature’s posture is also intriguing. Most dicynodonts had a seemingly awkward posture, with straight hind limbs (much like mammals), but sprawled, lizard-like forelimbs. Given the way that L. bojani‘s upper bone is connected to its shoulder, it seems like it might have walked like modern reptiles, which would have helped support its massive weight. Journal Reference: T. Sulej el al., “An elephant-sized Late Triassic synapsid with erect limbs,” Science (2018).